Dalmeny Fire and Rescue provides fire and protective services to the residents of the Town of Dalmeny, as well as, contract fire and protective services to a portion of the Rural Municipality of Corman Park, including a section of Highway 16. The Town of Dalmeny is comprised of residential, commercial, and assembly occupancies and a population of nearly 2000 residents. The surrounding rural community is comprised of a mixed agricultural environment (dairy, poultry, and cereal grain operations) mixed with a wildland /urban interface component (extensive acreages built amongst grass/bush topography). The department is comprised of 28 paid-on-call firefighters who provide fire suppression, emergency medical care and rescue services (varied from vehicle extrication to confined space rescue); as well as, fire prevention and education services to the community. 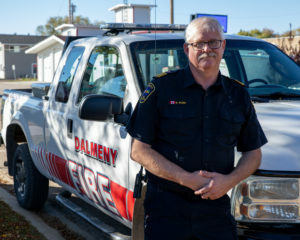 Dalmeny Fire and Rescue is an active member of the North Corman Park Fire Chief’s Association (Osler, Warman, Martensville, Dalmeny, Langham, Asquith, and Hepburn Fire Departments). Through this association, a strong mutual aid working relationship has developed. The NCPFCA has been instrumental in developing a regional firefighter training school, inter-operational communication network of VHF repeaters, Incident Command at mutual aid incidents, as well as, public education events. Check out members from Dalmeny Fire and Rescue and some of our mutual aid partners in action! A big thank you to Rick Zarowny from Cast One for highlighting the many aspects of our organization!